A stunned Leslie Feist won the $30,000 Polaris Music Prize on Monday for her fourth album Metals — then, unsure of what to do next, she hid under her table. Eventually, the Calgary-reared, Toronto-based singer/songwriter emerged and took the stage to accept her prize. But the 36-year-old — not necessarily a presumed favourite for the honour — was still so shocked, she had trouble finding the words. "This was my worst fear — oh my God," said a laughing Feist, clutching her gigantic cheque. "Oh, the thoughts racing through my head right now. You'd think from a lifetime of terrible speeches I would remember at one point to write something down, but I never do because it seems presumptuous to prepare. "I've had a phenomenal night," she added, composing herself. "I've been having such an unbelievably good time sitting here, watching this cavalcade of really good music." "Everyone had a favourite here tonight, and I did too — and I did not think it was me," she added in wrapping up. "I'm just really shocked and really, really grateful to be a part of the night." It was a fitting end to a year that was really too close to call for Polaris watchers. The award — given to the best Canadian album of the previous year — was ultimately determined by a 10-person jury of music journalists, bloggers and broadcasters at a cozy gala at Toronto's Masonic Temple. It's rarely easy to peg a Polaris front-runner, when the tastes of a small jury determine the winner and surprises are pretty much the norm, but this year seemed particularly difficult. Drake sold a ton of records, but that doesn't matter at the Polaris. Still, his Take Care was a carefully considered, genre-blurring triumph that received resoundingly positive reviews and sounded unlike anything else on the charts. Japandroids were also considered a favourite, given the broad accessibility of their frenetic, fuzzy indie pop, their critical bona fides and reputation for furious live performances. Meanwhile, Grimes — the talented electro-pop composer from Montreal whose real name is Claire Boucher — was also a popular pick given how she's wrested international acclaim for her unique, dreamy third recordVisions, another forward-thinking statement from a young artist. But a convincing case could have been made for any artist on the short list. Feist might have seemed a less trendy choice given her already well-established award-winning pedigree — she's a four-time Grammy nominee, a previous Polaris shortlister and an 11-time Juno winner — and the fact that Metals wasn't as much a pop-culture phenomenon as her breakthrough, The Reminder. But Metals still went platinum in Canada and won over critics with its hand-crafted folk and subtle lyricism. 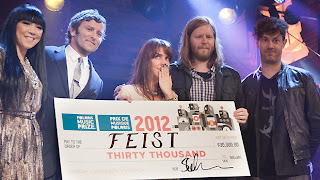 And if Feist was seen as an under-the-radar candidate for the award, fellow nominee Kathleen Edwards of Ottawa pointed out in a speech following her performance that there's never a surefire way to predict a Polaris winner. "The last time I was nominated, they called out all of the nominees and the person who won was the person that I least expected to hear as the winner," Edwards said, who lost out in 2008 to Caribou. "So I am grateful to the Polaris for creating a conversation about music, and I am grateful to Caribou for making me think about how I hear things." 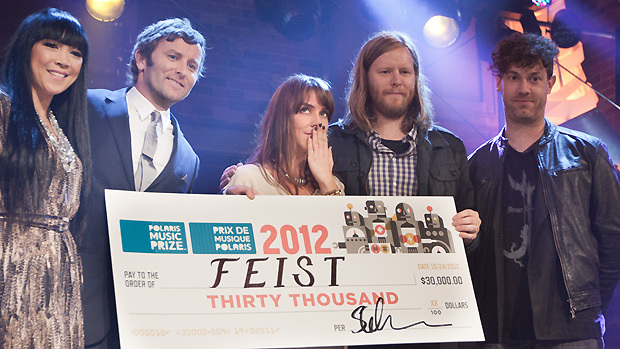 Feist echoed that sentiment as she accepted her award. "I've been really grateful tonight. I learned so much about amazing stuff going on," she said. "And every single band that was up here — not to mention every band on the short list, not to mention so many bands that didn't make the short list — belong here tonight and belong standing with a novelty cheque." Well, there were plenty of other Polaris veterans present Monday. F---ed Up, who won the award in 2009 for The Chemistry of Common Lifebefore receiving another nomination this year for the ambitious rock opera David Comes to Life, provided a flashback to their victorious year when frontman Damian Abraham stripped off his tie-dye T-shirt during their two-song performance on Monday. (He did, however, keep his pants on this time). Other artists who had been nominated before were similarly relaxed. Edmonton rapper Cadence Weapon, up this time for Hope in Dirt City, was actually also in the running for the very first Polaris, back in 2006. "There was no Twitter — it was a scary time," joked Roland Pemberton, who brought his grandma, mother and two sisters to the gala. The evening wasn't all so light-hearted. Its most moving moment came when Alexei Perry took to the stage to accept the nomination for her Montreal electro-rock duo, Handsome Furs — which had consisted only of Perry and her then-husband Dan Boeckner. The band announced its split in May, and Perry fought back tears as she stepped to the microphone alone to address the crowd. "Some people here will know how hard this is for me, but I'm also very, very proud," she said. "So I'm here to say thank you on behalf of Handsome Furs, for Dan and I, for letting us risk ourselves in pursuit of our ideals. It is worth it. And I am honoured to be in a room full of other people who also take those risks. "Because for me, time and time again — especially currently — it is art and music and literature that has saved my life. So I'm honoured that you loved us and our work."